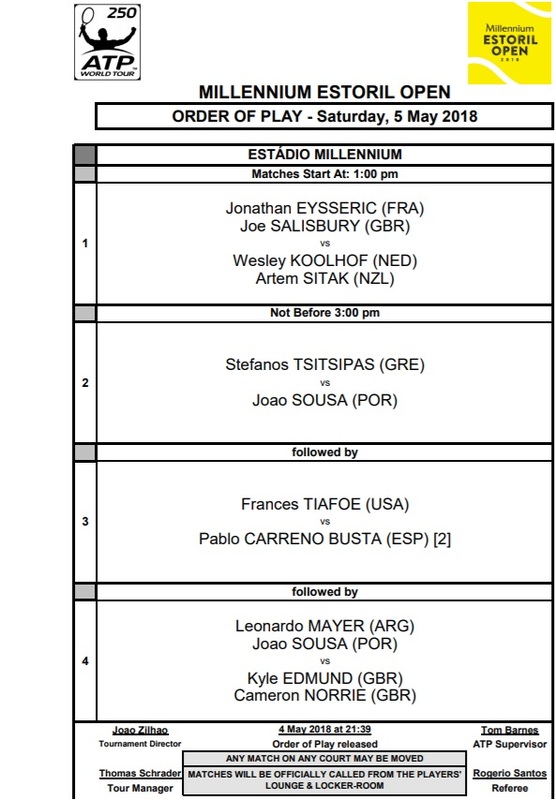 The semifinals at the Millennium Estoril Open are set and will be played on Saturday. The doubles teams will step up the court too, to play for a spot in Sunday's final. Stefanos Tsitsipas, João Sousa, Frances Tiafoe and Pablo Carreño Busta were the winners of the day. 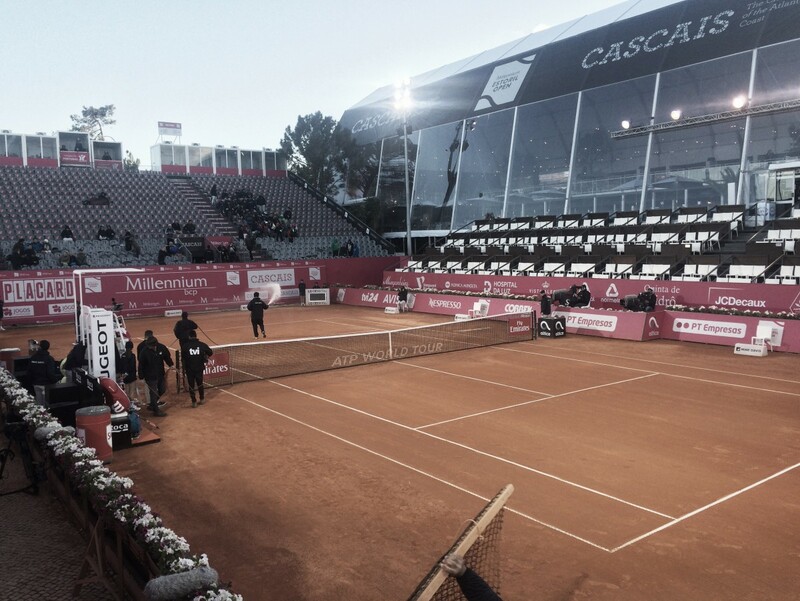 It was an intense day at the Millennium Estoril Open with 3 out of 4 matches going to a third set. In the first match of the day, Stefanos Tsitsipas had to fight a lot to survive Roberto Carballes Baena. The two players had a change of breaks in the first set but it all ended up in a tie-break, won by the older player 7-6(2). The second set was a one-way set to the Greek, who broke his opponent serve twice at the beginning of the set and took the lead 4-0. After that, both athletes held their serves and Tsitsipas conquered the set with a love hold. Roberto Carballes Baena took the lead in the third set by 3-1, but Stefanos Tsitsipas was able to turn it around and win four consecutive games to be up 5-3. When he was serving for the match at 5-4 he was broken at love and they had to decide it in a tie-break. After Carballes Baena led 3-0 in the tie-break, the world number 44 won seven straight points to book a place in the semifinals. The match ended 6-7(2), 6-2, 7-6(3). João Sousa had never won a match at the Millennium Estoril Open until this year and now he is already in the semifinals. The Portuguese defeated the third seed, Kyle Edmund. The players held their serves as far as the 4-3 in Sousa's favor, and then, the world former top 30 broke Edmund's serve to be up 5-3. He served for the set and in an advantages game, Sousa conquered the first set 6-3. In the second set, Kyle Edmund played a much better tennis and raised his level to take a 3-0 lead. João Sousa won a game but after that, the British player won it all to close the second set 6-1. The home player would never give up as the crowd was cheering for him. With a hold at love started the last set and it was a one-way set, as the currently ranked 68th on ATP didn't let his former doubles partner win a game. Sousa won the last set 6-0 and consequently the match. The final score was 6-3, 1-6, 6-0. Frances Tiafoe is through to the semifinals here at the Millennium Estoril Open, after defeating Simone Bolelli in straight sets. The North-American had to fight a lot in the first set and had to save a breakpoint so that Bolelli wouldn't serve for the first set. Both players held their serves until the 11th game of the first set when Tiafoe broke Bolelli's serve to be serving for the match. In the second set, Tiafoe started with a 5-1 lead and then won the set 6-2 playing very solid. The match ended 7-5, 6-2. It was tough for Carreño Busta to finish the first game of the second set as he faced five break points and wasn't able to save the last one and got broken. Nicolas Jarry pushed it into the limit and conquered the set 6-2. To finish the match, Pablo Carreño Busta played too solid to close the match with a 6-1. The result ended 6-2, 2-6, 6-1.